For someone who always prides themselves on being super organised, in control and having a good memory, becoming a mummy of not one but two boys has made for some interesting 'nappy brain' moments. I'm not sure whether its sleep deprivation or the amount of 'stuff' one has to remember when going out and about with 2 boys or both! Today was just one classic example of a nappy brain moment. Noah was back to daycare yesterday and today, and as I had promised to pick him up today, I decided to go and get him a bit early so we could take advantage of a lovely, sunny and relatively wind-free afternoon to ride his new bike along the waterfront. Given how confident he is and how much enjoyment he is getting out of riding, we're keen to make the most of any opportunities to get out and about on the bike. We even tried to take the bike to the zoo earlier in the week but found out it's a no biking zone...shame, but I guess it makes sense given how hilly some of the paths are. Get 100 metres down the footpath and then realise my mistake....can anyone guess at this point? The penny drops.....I'm looking for our blue car and I'm in the red car today so have walked straight past it! Attempt to send the text and my mobile tells me I have too many messages in my inbox/outbox, aaagh!! When my phone can hold over 500 messages and I have been getting warnings for the past few days that it's getting near capacity, why is it this text that must fail to send! Then my phone asks do I want to delete some first so I can send the message? Sure I do, since there are 2 other people waiting behind me to use the machine by this time! Delete one message quickly so I can have enough space to finally send the text and get my ticket which I put in the RED car! Off we go again, 2nd time lucky as we decide to venture down the footpath in the other direction towards Waitangi Park while I mourn the loss of all the brain cells I have clearly lost in the past few months and years! The rest of our afternoon, however, was delightful. Apart from forgetting the camera altogether, I think that pushing the stroller would probably have prevented too many photo opportunities anyway (that's my excuse and I'm sticking to it! ), so we'll just have to make do with my prose instead! We headed past the boat marina, across the bumpy bridge which Noah thought was great fun as he bopped up and down on his bike. We headed round the back of Te Papa to see if there were any ducks in the mini lagoon (which there weren't). 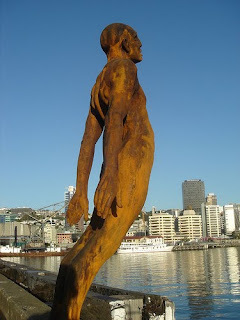 We watched the Bluebridge ferry coming into the harbour alongside what seemed like a tiny personal pleasure craft, and Noah was fascinated by the statue of Solace in the Wind leaning out over the harbour. On the return journey we spotted some small, grassy hills in the distance near New World which Noah was keen to roll and tumble down (his latest thing!). He spent a good few minutes entertaining himself, trying to avoid the bees in the clover and getting grass stains galore whilst I continued to rock the stroller to keep Mr. Mylo asleep. After a quick chat to Daddy on the phone with Noah checking that toad-in-the-hole was still on the menu for the evening, we headed back to the car, a much more straight forward exercise this time round. That was apart from the little pit-stop Noah had against the side of the car after informing me he needed to go wee wees, and me doubting he would last the 15 minutes home, especially knowing that Mylo was gagging for a feed as it was. Oh well, what's a little wee on the road between friends..as I raced to get everyone and everything back in the car, Noah informed me 'You're stepping in my wee Mum' every time I went backwards and forwards with children and belongings. So ends a lovely afternoon out with my boys...! And I shall try not to let the fact that the organised and usually in control head on my shoulders seems to be bobbing around a little these days like one of those toy dog heads you see in the back of car windows! Sorry I shouldn't laugh - but your writing is so funny in this post and what more can you do, but laugh! I cracked up at the end; when you described your head like, 'One of those toy dog heads in the back of car windows!'. I'm laughing because I have felt like that so many hundreds of times that after a while it becomes frighteningly normal!